In the classroom, we employ rhetorical inquiry as a lens to examine how audiences make meaning. This approach facilitates a heightened awareness of the message under consideration as well as an appreciation for the ways people employ language, image and more cinematic means for persuasive purposes. Importantly, my approach builds students’ capacities in understanding the diverse potentials for meaning-making within the context of visual and web-based texts. COM 200 Communication Theory and Practice This introduction to communication and digital media studies focuses on various ways people employ language, image, and more cinematic means for communicative purposes. Through a series of hands-on projects, students learn to research and analyze contemporary issues and trends in the field of communications, with an emphasis on digital media. In doing so, students examine how communication technologies are impacting the relationship between media audiences, producers, and content. COM 201 Ethics in Communications This course explores ethical issues in the field of communications. Themes include privacy, civic media, citizen journalism, copyright, intellectual property, cyberbullying, net neutrality, social networking, global ethics, and digital divides. 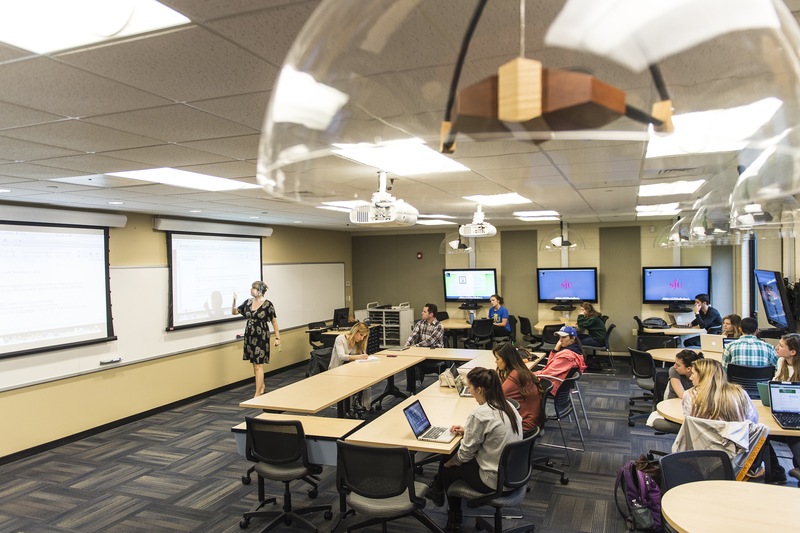 Students develop skills in applied ethical decision-making, democratic dialogue, and civic participation through a range of projects in both online and community settings. COM 202 Digital Aesthetics An important direction for digital media studies is inquiry into the aesthetic as a mode of sensory experience. This course takes a rhetorical design-based approach to examining aesthetic experience in digital environments. Throughout the course, the following questions will be considered: How are we to understand the aesthetic as a mode communication? How do audiences create meaning through direct sensory perception as well as through mediated experience? How do current interfaces, design tools, and choices in form + content work to shape the audience’s (or user’s) aesthetic experience? How does design function rhetorically, persuading an audience through multimodal elements? How can designers create an engaging aesthetic experience while delivering a message to an audience? COM 371 Civic Media This course engages students in questions about media, technology, sociality, and society. Students examine both theoretical and experiential foundations in order to understand the relationship between mediated communication and human communities. Those who complete this course will gain hands-on experience engaging audiences and developing communities through various social media platforms. COM 382 Digital Publishing Italy ; New Zealand ; Greece . In this course, students learn about trends in digital publishing. While on location, students experiment with methods in multimedia content creation, including photography, audio, and video. Throughout the course, students will examine how narrative story elements work within digital publications. Through a process of peer-review and revision students have a portfolio of work to submit to publications at the end of the course. COM 472 Visual Rhetorics We will take a design thinking approach to multimodal form making. We will wear many hats as we try on various creative roles pertaining to aesthetic production. In other words, we will make things. A lot of things. Throughout the course, we will examine the elements of aesthetic experience and meaning-making in order to better communicate with individuals, institutions, and locales that are increasingly connected in a global society. COM 472 Digital Storytelling Data-driven storytelling is a powerful and innovative extension of traditional methods of research and dissemination toward new audiences and ends. In this course we will explore ways to creatively interpret data, rendering information more useful, engaging, and accessible. Over the course of the semester, students will work with a variety of open source platforms and tools for translating data into visual and interactive forms while discussing principles of narrative, audience, and design. COM 441 Applied Social Media Research Join our thinking (and doing) tank by working with the Beautiful Social collaborative. Students in this course will be actively involved in research concerning social media and community engagement with local not-for-profit organizations. Students will examine both theoretical and experiential foundations in order to understand the relationship between mediated communication and social communities. Not only will students learn how to effectively communicate to audiences through a variety of platforms (including Facebook, Twitter, blogs, and Instagram), they will gain hands-on experience in content strategy and community engagement while working with a local organization. COM 442 Non-Profit Communications Not-for-profit and community-based organizations rely on strategic digital communication to create social change. Students in this course gain in-depth knowledge of communication theories and practices while conducting research projects with local organizations through the Beautiful Social Research Collaborative. Those who complete this course will know how to apply a variety of social media theories and practices to the social web (including network theory and social network analysis). Students in the course will actively participate as a member of a project team to complete projects with clients in the Greater Philadelphia area. Local travel is required. An important direction for design and digital media studies is inquiry into the aesthetic as a mode of sensory experience.